Quantity in Stock:Unfortunately, this item is out of stock. We may have a similar item that will suit your needs. Please view our related items. The BD Biosciences LSR II is a multi-laser flow cytometer that utilizes fixed-alignment lasers that transmit light reflected by mirrors through a flow cell to user-defined octagon and trigon arrays. These fluorescence signals are collected and translated to electronic signals then converted to digital data. The BD LSR II utilizes innovative optics and digital electronics to provide highly flexible yet powerful performance with a greater sensitivity, which yields more information from each sample. The BD LSR II can be configured with one to four fixed-aligned, air-cooled lasers; this configuration features three lasers for eleven color excitation. These solid state lasers consist of the Coherent Sapphire, Coherent VioFlame Plus, and Lightwave Xcyte, all designed to consume less power, produce less heat, and have a lower overall lifetime cost compared to gas-filled lasers. The Coherent Sapphire (blue, 488 nm) produces no plasma glow, lowering noise during excitation. The Coherent VioFlame Plus (violet, 405 nm) excites Cascade Blue, Pacific Blue, and Alexa Fluor 405, along with BD Clontech Living Colors GFP, YFP, dsRed, and CFP. The Lightwave Xcyte (UV, 355 nm) allows routine experiments to be performed on samples with UV dyes, such as DAPI, Hoechst, and Indo-1. The collection optics includes patented octagon and trigon optical arrays, which increase sensitivity and flexibility for more sample information. The 488-nm octagon array can collect up to seven colors along with side scatter, while the 633-nm, 405-nm, and 355-nm trigon arrays can detect up to three colors. Acting upon the principle that the reflectance of light is more efficient than the transmittance, more colors can be detected with minimum light loss. The BD LSR II utilizes BD FacsDiva software, which provides a means for experiment design, instrument control, and data analysis. FacsDiva allows for improved workflow, featuring reusable acquisition templates, an auto-spillover matrix for automated compensation, offline compensation, and Biexponential data display for better visualization of digital data. All experiment data, including instrument settings, plots, compensation matrices, and statistics, is stored in a database for reuse and reanalysis. Availability of UV gives a capability to perform Ca 2+ flux experiments. Unlike a FACSCalibur, it is possible to use PE-Cy5 and APC together. Coefficient of variation PI: Area of <3%, full G0/G1 peak for propidium iodide (PI)-stained chicken erythrocyte nuclei (CEN). Enables separation of fixed platelets from noise. Theoretical maximum electronic data collection of 70,000 events/second. Typical operation at 20,000 events/ second which requires a sample concentration of 2 x 107 cells/mL at an instrument flow rate of 60 μL/min. The BD LSR II optical layout allows for up to 4 laser wavelengths for laser excitation. New options are developed on a regular basis. Please check with your local sales representative for the latest custom options. Rectangular Quartz Cuvette: Internal cross-section, 430 x 180 mm External quartz cuvette surfaces are antireflection coated for maximum transmission of laser light. Fixed optical assembly of the lasers, with up to 4 spatially-separated laser beams. The quartz cuvette is coupled to the emission lens by a refractive-index– matching optical gel for optimum collection efficiency. The BD LSR II uses BD’s patented octagon and trigon detection system. Using reflective optics and fiber-coupled PMTs ensures more efficient light collection than that obtained from transmission optics. Please see the separate filter guide for information on dye and filter options. One 8-L sheath and 10-L waste container provided. BD FACSFlow™ supply system: automated fluidics system, which includes a rolling cart and two 20-L Cubitainer® packages. All of our equipment is fully tested to perform at factory specifications before being shipped. Our technicians decontaminate and clean equipment upon arrival at our facility and upon your purchase to create a neutral environment for your labs use. Preliminary testing is then conducted on our equipment to identify potential defects. Upon completion, we replace all faulty and/or under-performing parts with original manufacturer parts that perform up to specification. Any parts known to fail or malfunction on the piece of equipment are removed and replaced to insure the extended lifetime of your equipment. Any necessary preventative maintenance is performed alongside repairs, so your purchase will be ready to go as soon as it arrives. All of the electronics and boards are tested for proper function and response by our industry trained technicians. Any electronic deficiencies detected are immediately repaired. Final testing cycles ensure your equipment performs fully at manufacturer specifications, guaranteeing you receive a properly working product ready for use. Once we finish our rigorous testing and decontamination procedures, your order will be packaged to best protect it during shipment and will include delivery insurance. 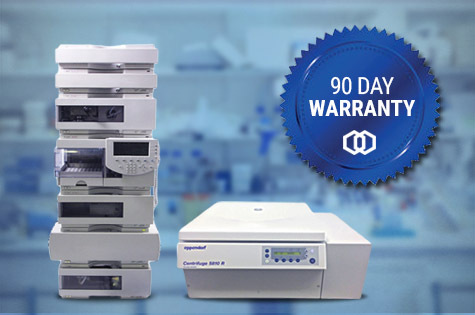 Why Buy From Marshall Scientific? Every product we offer undergoes a rigorous inspection process to verify that all manufacturer specifications are met. 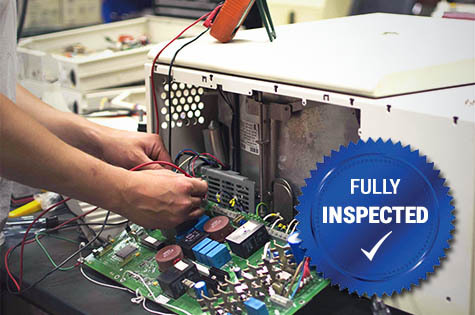 All of the electronics and boards are tested for proper function, and any necessary preventative maintenance is performed alongside repairs by our industry trained technicians. Our primary goal is to offer products that are as close to new as possible at an affordable price. Our technicians decontaminate and clean all equipment upon arrival and upon purchase to create a neutral environment for lab use. Preliminary testing is conducted to identify potential product defects, upon completion, we replace all faulty and/or under-performing parts with original manufacturer parts that perform up to specification. Any parts known to fail or malfunction from excessive use are removed and replaced to insure the extended lifetime of your equipment. All electronics and boards are tested for proper function and response by our industry trained technicians. Any electronic deficiencies detected are immediately repaired. Final testing cycles ensure your instrument performs fully at manufacturer specifications, guaranteeing you receive a properly working product ready for use.